You ever add something to a game and then spend far to much time messing about with it? So then, water ... added some render code so that arbitrary tiles can specify masks that apply the water affect. Below is a container (will hold the organs that the player has to retrieve) containing some green gloop. It required a separate rendering pass to the swimmable water (or what approximates to it in my ad-hoc thrown together renderer) so that it can render the background behind and the tiles in front. Just got to find a way to get some bubbles in there that can be masked off. What you probably can't tell in the GIF above is that the little blood vials that are collectable also have this mask applied - the blood inside is distorting the background. Yeah, I've definitely taken this too far. Also tweaked the water effect and made another little play level to have a swim. Additionally added another background level of parallax - no idea what to put in it yet. If I had a creative director I'd have probably sacked him by now. Looks great, the liquid effect on the blood vials is a nice touch! Having little details like that makes everything feel more alive. Wow, you did a fantastic job with just 16 colors. Thank you! Here's a joke with no punchline for you ... "A skeleton went to a bar and ordered a pint of beer and a mop" ... ba-da-bing! When it comes to art I'm definitely on the programmer side of the curve ... so I need the restrictions that 16 colours enforces. Nothing visual to update with at the moment as I've been working on some fairly aggressive refactoring of the code I have. My approach to development is very much to hack features in, get them working then refactor into something a bit tidier. So I've been reverse engineering a (very) basic entity system so I can throw in some basic mechanics like laser force-fields, drainable water areas and more bad guys. Spent a while re-jigging my embryonic entity system so that things can be associated with other things (for example buttons can turn off forcefields). To accompany this I rewrote the Tiled level loader to take advantage of it's object layers, specifically using the properties to specify the relationships between entities. In between small bouts of coding (getting harder to fit in) I've been reading a fair bit about platformer level design. I still haven't decided exactly what kind of game this will end up being - I'm veering towards puzzles rather than out-and-out action, but may make it a bit of a mix between the two. When I started out the aim was to create an homage to Chuckie Egg and Jet Set Willy (dating myself here) - so I need to reign in the scope a little here to make sure I can finish the thing. Lot's of interesting advice there. Hopefully going to pick up the pace a little from here on. Still, it all worked out - radically cleaned up my Tiled loader code, plus finally sorted out the rest of the system so I can throw entities about with custom handlers for AI etc. The result, so far, is that I can flag chunks of scenery as being independent entities that I can then do things with - such as move around on paths (defined using polylines in Tiled), float about in water or have their state changed via triggers. 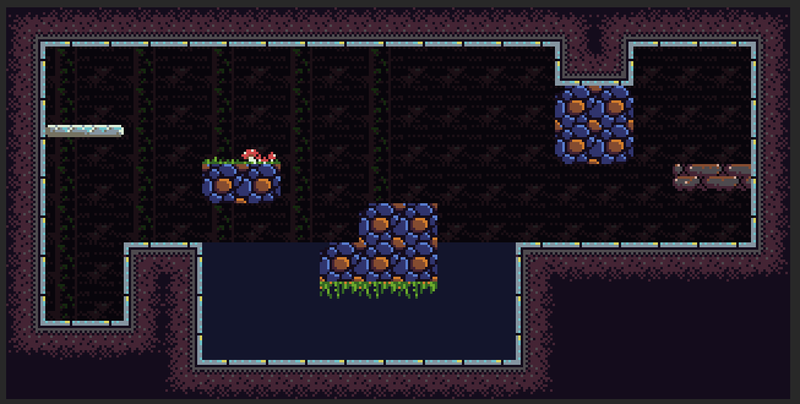 Above is a test level showing a simple up/down platform, some tiles following a path, a big chunk of scenery bobbing about in water and a square chunk of stone hanging from the ceiling waiting for a button press to release it. I've also now replaced the old very specific custom code that drove the up/down platforms with this new generic system, which cleaned things up considerably. So, I'm getting there with organisation and slowly getting enough elements together so that I can put some proper trial levels together. Of course if I was't writing this thing from scratch then I wouldn't have had to write a (simple) physics system, an XML parser, a Tiled level loader and a million other things. But I can't help it ... it's more fun this way. But I can't help it ... it's more fun this way. Yea, the fun is making stuff work. When things don't work, it's not fun, but that can be prevented by knowing what one is capable of. You seem to be doing a good job. Have you played Wario Land 1 or 2 by any chance joeyspacerocks? Spooky Pooky reminded me of those games based on the on-screen-sizes and gameplay. Playing around with screen sizes at the moment actually as I'm thinking my current size is a bit restrictive for level design. So I'm experimenting with zooming it out a bit. 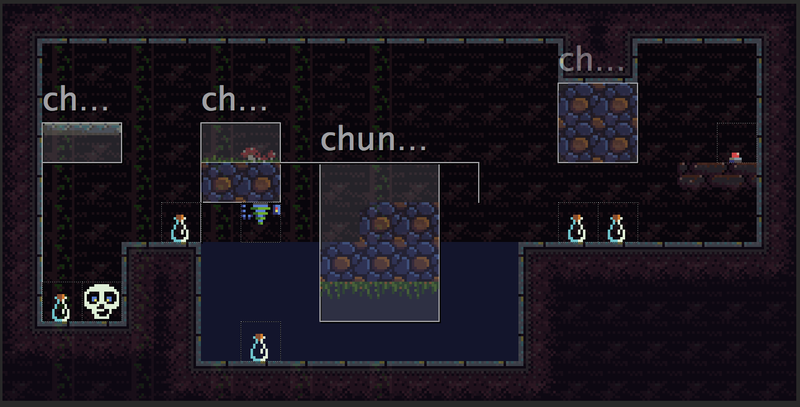 I've been tweaking the system a bit so that I can properly attach entities in Tiled maps to other moving things. Below is a laser/forcefield attached to the moving platform. Had some fun messing about with particles to add some steam where the laser hits the water and sparks for the ground. I've also zoomed out a bit so that you can see more of the play area - will give me more options for level design. Next up is some title / menu design and hopefully some power-ups - i.e. collectable organs that'll affect game play in some way. Spent some time adding some wibble ... not completely sold on this yet as with my low resolution it comes across as a bit glitchy, but it'll be useful for some of the bigger sprites. Gone a bit crazy with making things bounce. Don't be fooled, the brain does pickup subtle changes taking the motion into account, so even with small sprites it should work fine (although the wobbling direction probably could be improved). I have gone a little over the top. Yes, I may have to remove it from the main character, but been playing around with it for other things (like score indicators that pop up when you collect things) and it looks pretty good there. Moderation, that's the key. Given that this is supposed to be a dev log there's not been much about the actual dev; so I thought I'd stick some notes down about how I'm designing levels. I'm using the Tiled Map Editor to create levels which is a wonderfully flexible tool. In the second you can see some boxes which are used to outline blocks of tiles in the layer below that should be separated from the main layer and turned into an independent entity. I then use properties on these rectangle objects to define various flags as to how the object behave - e.g. fixed in space, affected by gravity. Additionally they can be any entities can be programmed to follow paths. This is done by drawing a path using as a polyline object and relating the two together by name using a 'path' property on the parent object. I use a similar approach to associate buttons (which are just tile objects) with, for example, a laser forcefield, or with a block entity. I use a third layer for liquid which I indicate using a simple tile. In the game I use the presence of this tile to set flags on the underlying tiles to indicate they are in water. I render the water using two passes - one to render the water using a simple shader (the water can be at any level) into a framebuffer and another to compose it with the background to add the wibble shader effects. It's a pretty flexible system - I can also tell entities (i.e. Tiled objects) that they 'belong' to a section of scenery by specifying it's name as a 'ground' property. Overall I'm pretty impressed by Tiled as I had assumed that I'd end up writing some kind of proprietary format or tool - so far it's not been necessary. The tile-sized boxes are showing because I place normal sized entities in the level as Tiled tile-objects (which it renders with a little box outline). Originally I just placed these in the level as tiles that I then picked up as I read the level in, but I switch to using tile objects so that I could add individual properties to each object placed in the map. For example, a button/trigger is added as a tile object with a property indicating which other object it's target is.